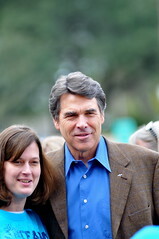 Julie and I early voted this afternoon for my boss, Governor Rick Perry. Below is the text of an email that I received from someone else who works for the Governor, explaining why it is important to vote for him in this primary as well as for Justice Eva Guzman. Early voting is underway. You can vote early through next Friday. The Primary is Tuesday, March 2nd. I encourage you to vote early. Having been involved in the political process for close to 30 years now, I can think of no time in the history of our country and our state that it is more important for you to choose the right leaders. I know that you are all encountering your own issues with this current economy, and there is a lot of uncertainty, and in many cases fear, of what the future holds. 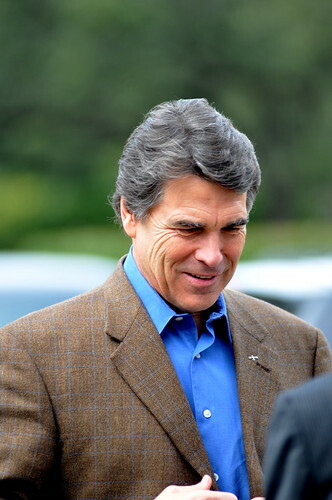 I know that you will find it no surprise that I am encouraging you to vote for our current Governor, Rick Perry. I’m not going to give you the political reasons – you can see those on the tv ads that are currently running. I am asking you to support him because he has done a great job leading this state during very difficult times. Things are tough on many Texans right now, but it could be a lot worse if steps had not been taken prior to this current downturn to have Texas in a strong position to weather the storm. Those decisions did not happen by accident. I have had the privilege to see our Governor at work behind the scenes. I know how much he loves this state and the people of this state. He is seasoned and has made the tough decisions that have needed to be made, many times knowing that he would take the political hit. He does not govern by opinion polls or from the influence of special interests. He isn’t looking for the endorsement of newspapers. He represents the businesses and people who work hard every day – The folks like you and me who don’t ask anything from government other than to let us keep as much of our hard earned salaries and business profits as possible to support ourselves, our familes, and help in our communities. He is not very popular with the current administration in Washington DC. He is taking strong stands every day to protect Texas and her people from what some in the federal government would do to our state, if not challenged. The threats are real and too numerous to discuss in one short email. This is not the time to elect someone who would need time for on-the-job training. The people in office who would pass laws to hurt our state would not give someone a grace period. I would be happy to answer questions or direct you to sources who can answer your questions. I would also like to encourage you to vote for Justice Eva Guzman for the Texas Supreme Court. The Governor just recently appointed her to the seat she holds on the Court. Justice Guzman is known throughout legal circles as a strict constructionist with an unmatched work ethic. She is a principled, conservative judge. As an associate justice on the 14th Court of Appeals in Houston, she ruled on thousands of civil and criminal appeals, and authored hundreds of published opinions. She was recently recognized by the Hispanic National Bar Association as Latina Judge of the Year and as 2009 Judge of the Year by the Mexican American Bar Association of Texas Foundation. She has also been named Appellate Judge of the Year by P.O.L.I.C.E. Inc. and the Houston Police Officers Union. She has an incredible personal history that I would be happy to share with you. For all of my female friends, you would love to hear about her story and journey to end up making history as the first Hispanic female to serve on the Supreme Court of Texas. Thanks to each of you for your indulgence as I have shared my opinions with you. I have met Justice Guzman on several occasions and I have spoken with her at length and in depth about her judicial philosophy as a principled conservative Judge. She is a proven hard worker on the 14th Court of Appeals and I encourage everyone to vote for her in the primary and general election in her race for place 9 on the Texas Supreme Court. Beldar has some thoughts on why Debra Medina’s answer to Glenn Beck was not just bad, but was actively disqualifying in her race for Governor. Those aren’t just wrong answers, they’re disqualifying answers. Public servants, to be effective at all, must be able to make good judgments. Indeed, they must be able to make good judgments even with less than perfect and complete information. And that’s especially true of those in the executive branches of government. Medina’s attempt to cast blame on her opponents for this kerfuffle is pathetic. Of course her opponents will make the most use they can of her screw-up — Hutchison because Medina had become perceived as a threat to knock her out of second place, Perry because he hopes he might squeak in with a majority and avoid a run-off. With this Obama-like refusal to accept responsibility, Medina has compounded her original offenses and further demonstrated her lack of political stature. Similarly, insisting that she’s just vindicating the public’s right “to ask questions” is entirely disingenuous. “I support free speech, including the right to espouse crackpot positions,” one can say. But this sort of wink and nudge and phrasing of ridiculous accusations as “mere questions” can fool no one. more here. Read it all. Debra Medina is in the Republican primary for Texas Governor and has been making some progress in the polls against Governor Perry and Senator Hutchison. There was even some talk based on recent polling that she could finish second ahead of the Senator. I think that talk will be finished after this morning’s appearance on Glenn Beck’s radio show. As Glenn Beck says at the end of this clip 9/11 trutherism is “the fastest road back to 4%”. I was asked a question on the Glenn Beck show today regarding my thoughts on the so-called 9/11 truth movement. I have never been involved with the 9-11 truth movement, and there is no doubt in my mind that Muslim terrorists flew planes into those buildings on 9/11. I have not seen any evidence nor have I ever believed that our government was involved or directed those individuals in any way. No one can deny that the events on 9-11 were a tragedy for all Americans and especially those families who lost loved ones. The question surprised me because it’s not relevant to this race or the issues facing Texans. This campaign has always been about private property rights and state sovereignty. 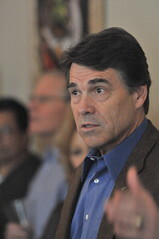 It is focused on the issues facing Texans. It is not a vehicle for the 9-11 truth movement or any other group. The real underlying question here, though, is whether or not people have the right to question our government. I think the fact that people are even asking questions on this level gets to the incredible distrust career politicians have fostered by so clearly taking their direction from special interests instead of the people, whether it’s Rick Perry and the his HPV mandate or Kay Hutchison and voting for the bank bailout. It is absolutely the right and duty of a free people to question their government. Texas does not need another politician who tells you what you want to hear, then violates your liberties and steals your property anyway. I fully expect to be questioned and to be held accountable as Governor, and that’s the underlying issue here: should people be questioning their government. And the answer is yes, they should be. It doesn’t matter how surprised she was or how off topic she thinks the question is. The answer she gave Glenn Beck is unacceptable outside of a small fringe. just let her keep talking. The curtain has come down on what can best be described as a brief un-American moment in our history. That moment began in the fall of 2008, with the great financial panic, and gave rise to the Barack Obama phenomenon. The nation’s faith in institutions and time-honored ways had cracked. In a little-known senator from Illinois millions of Americans came to see a savior who would deliver the nation out of its troubles. Gone was the empiricism in political life that had marked the American temper in politics. A charismatic leader had risen in a manner akin to the way politics plays out in distressed and Third World societies. There is nothing surprising about where Mr. Obama finds himself today. He had been made by charisma, and political magic, and has been felled by it. If his rise had been spectacular, so, too, has been his fall. The speed with which some of his devotees have turned on him—and their unwillingness to own up to what their infatuation had wrought—is nothing short of astounding. But this is the bargain Mr. Obama had made with political fortune. for something different, here is an outstandingly well done critique of a bit of leftist propaganda being shown in school to nine year olds across the country. It is in four parts. So far I have only watched the first two, but bravo! I have had a couple of windows open the last couple of days in order to post about them. one political and one theological. here we go. I believe it is crucial to understand that it doesn’t matter if the people engineering a collectivist state have sinister motives or not. In fact, the belief that their intentions make a difference is incredibly dangerous. It’s related to the catechism of the faculty-lounge Marxist, which holds that communism and fascism only failed because bad people were in charge of them. My hope was a year ago today when I was being sworn in that reversing that process was going to be easier partly because we were entering into a crisis situation and I thought that the urgency of the moment would allow us to join together and make common cause. That hasn’t happened. Some of it, frankly, is I think a strategic decision that was made on the side of the opposition that… I think that some of it had to do with a sense that the best political strategy was to simply say no. Here, in a nutshell, is the heads-we-win, tails-you-lose mentality that keeps the State plodding blindly forward, crushing a formerly vibrant economy beneath it. If you don’t answer Obama’s trillion-dollar health-care plan with your own trillion-dollar program, you’re an obstructionist – not an opponent to be debated, but an obstacle to be swept aside. We know that, as believers, we are chosen from before the foundation of the world. We also know that God loves the whole world and desires all men to be saved. We know that whosoever will may come and that if we don’t share Christ with people then there is no other way they can be saved. How all that fits together might really stretch our minds, but in trying to resolve the tension we must not neglect the things that have been clearly revealed (Deut 29:29). In other words… It is clearly our responsibility to share the message of Christ and our failure has eternal consequences for people (Acts 20:28). Yet, God also wants me to know, and be blessed by the fact, that I have been loved from all eternity and that was not conditioned on any merit or action of my own. How both truths fit together may be one of the “secret” things (Deut 29:29) that belongs to God. We can ponder and write books about it, but the “paradox” should never keep us from obeying what has been revealed. Our responsibility to choose Christ and to share Christ; our responsibility to is rejoice in the security that comes from knowing we are foreloved from all eternity. Failure to do either because we can’t resolve the tension would be sin. go read the rest of both of these. There is some good stuff out there on the interwebs. Mort Zuckerman of U.S. News and World Report is not happy. Probably everybody has seen this editorial by now, but wow. Zuckerman is not a conservative, but he is WAAAYYYY disappointed in President Obama’s first year. Obama’s ability to connect with voters is what launched him. But what has surprised me is how he has failed to connect with the voters since he’s been in office. He’s had so much overexposure. You have to be selective. He was doing five Sunday shows. How many press conferences? And now people stop listening to him. The fact is he had 49.5 million listeners to first speech on the economy. On Medicare, he had 24 million. He’s lost his audience. He has not rallied public opinion. He has plunged in the polls more than any other political figure since we’ve been using polls. He’s done everything wrong. Well, not everything, but the major things. The political leadership of the world is very, very dismayed. He better turn it around. The Democrats are going to get killed in this election.